Being a long term saver and bargain shopper, there is something inherently stressful for me about the holidays. I feel the need to “make it special” and somehow that gets interpreted into LOTS OF BOXES under the tree or for the 8 nights of Hanukkah. I feel forced to buy things that often aren’t needed. And I’ve spent a lifetime trying to only buy what is needed, with an occasional want as a bonus! Early on, I felt a bit of competition in terms of living up to my Mother-In-Law’s spectacular Christmas mornings, where the opening of presents lasted hours and the pile of boxes were sky high! Once I started down that path, my kids got used to it. So, how do you change your ways? When my kids were little, I’d make them clean out their room prior to Christmas morning and I’d find items that I gave them last holiday, still in the original package. I’d rationalize that it was only a $10 item, but I knew it went against my belief about spending just for spending sake. And then I realize I’m conflicted. One year, we decided to not give gifts during some difficult financial times, and I know I felt like we were missing out or at least my children were. Over the years, I’ve found myself pushing items my children or my husband and I needed, off until December so I can buy them, and give them out during the holidays. It sort of makes sense, but I’m always left feeling like I was coerced to spend for the holidays. And I didn’t take the time to find something really special that would surprise them; I simply put things they needed under the tree. Then, there’s the awkward moment when a friend gets you a gift but you didn’t reciprocate. And how about tipping the newspaper deliverer, the waste management people, and the mailman? How do you know how far to go? Does everyone go through the gambit of emotions around holiday spending; about how much to spend and for how many people? Or is it just me? Because of being in the financial industry, am I just hyper aware of spending? And what about people who simply don’t have the money; do we expect them to give gifts anyways and go into debt? So… this is why I get stressed during the holidays! In keeping with the fact that November is National Hospice Awareness month, as well as our focus on caring for our aging parents, I decided to go personal with this blog and share my own experiences in each area. Two years ago, my brother, sister and mother and I had to confront the reality that our 81 year old father/husband was terminally ill. He had liver damage from fatty liver disease and both his liver and kidneys were starting to shut down. The only treatment option would have been a liver transplant and at 81 that’s truly not an option. Initially, we had to deal with the issue of whether or not Dad was a DNR (Do Not Resuscitate). Now, Dad was a really smart and incredibly practical man, so I was pretty certain that if his heart gave out at any point, he wouldn’t want to be brought back. But he was going in and out of consciousness due to drug interactions that a failing liver couldn’t process. Therefore, my Mom was in charge. After 56 years of marriage, when the hospital asked us about a DNR, Mom’s only answer was that they needed to do whatever and go to any lengths to keep Dad alive. It took a lot of family meetings and then using moments of Dad’s lucidity to convince Mom that he was in fact by choice a DNR. This is a really tough conversation to have when someone is already ill. I urge you to have this conversation as a family far in advance of the potential need. For the next two months, Dad would go into the hospital for a week, and then be too weak to go home, so he’d go to a rehab center for a week or two. Another drug interaction and then we’d repeat the process. After 8 weeks, I said to my family, “is this really how Dad wants to spend whatever time he has left or how we want to spend our time with him, going from hospital to rehab and back?” So we decided it was time to bring him home and call in hospice. Hospice was incredible! They showed up in advance with a bed and everything we would need to take care of Dad at home. They took over medication dispensing, provided counseling and nursing assistance. They had 24 hour help available if we need to call someone. I was amazed at their service and even more so at their hearts. These people were incredible at helping the dying transition to the afterlife and help the living cope with the reality of their loved ones’ death. The most amazing gift a hospice nurse gave to me was when I had been with my parents out of state for a week, missing the holidays with my husband and kids and really felt like I needed to go home. But Dad had been hanging in there and I didn’t know what to do. The hospice nurse told me to go home and be with my family, but make sure and say goodbye as if it was my final chance to speak with my Dad. I thought long and hard about what I would say to him. When I was about to leave, I asked for a moment alone and I told my Dad what he meant to me and what wonderful parts of me I felt like I inherited from him. What a blessing to have that chance! I went home and when he died a week later, I was totally at peace having said that final goodbye. Fast forward one year… to early 2012, just one year after Dad died. I get the call from my sister, who lives near my parents, that my mom was having a stroke. It was a big one, but mainly affected her cognitive skills. She woke up not remembering that Dad had died, what year it was or much more than the names of her children and grandchildren. She also lost her ability to read. Immediately my mother lost her independence and we were looking at having to get her live in help so she could stay in her home. Over this year, many of Mom’s long term memories have come back, but the short term recall is shot. Her heart and blood work look great and she could continue to live a long time, but will always require care. My sister and I started doing our research and called a variety of different care giving services that were recommended by the rehabilitation center. Interestingly, Medicare was done paying for Mom’s rehab after 2 weeks, and she was basically being kicked out. We were shocked to find out that the cost of care was $220 a day, which equals $80,300 a year (Holy crap!). Now Mom and Dad had scrimped and saved their whole life so they could afford to pay for that for a while, but that’s a lot of cash! Gratefully, I had begged my parents around 12 years prior to buy Long Term Care insurance. The benefit I had sold them was only $100 a day, but with the cost of living adjustment, the daily benefit was now $165 a day, covering $60,226 of that $80,000 a year bill. Needless to say we breathed a big sigh of relief! The total cost of the premiums they paid for that coverage over the 11 years was around $55,000. We have already recouped that cost. But the reality of insurance is you hope you waste those premium dollars! Who wants to have a car wreck, a house burn down, die prematurely or lose their independence in old age? Obviously no one, but the question is can you afford the cost if any of those things happen to you? If the answer is “No”, then insurance is the answer. If your parents can’t afford LTC insurance, consider paying for coverage on your own or with your siblings. Next week kicks off the holiday season of Thanksgiving through New Year’s. This is a great opportunity to discuss all of these issues with your aging parents. Most people haven’t asked their parents these sensitive subjects. Don’t blow the chance to talk to them about their final wishes while they are healthy and can give you their input. You won’t regret it! Ben Stein Says Kids Today are Lazy! Last week I had the honor of seeing Ben Stein give the wrap up keynote speech at the Pacific Life Educational Symposium in Huntington Beach, CA, where I too was a guest speaker. He was phenomenal and had many good messages to impart on his audience. My main take away was his concern for the younger generation of teenagers, of whom I have two of myself. Ben seemed very disturbed that the discipline of work ethic has seemingly been lost on the younger generation. He also felt like our education system is lacking at best. I had to agree on a few points. I’ve noticed a big difference between my children and their friends and the generation I grew up in. For one thing, I had a summer job from age 13 on. I don’t recall my parents telling me I had to work; I simply wanted to. My first two summers were just jobs at the local swimming pool, but by age 15 I was working in restaurants doing odd jobs and grunt work. Again, I don’t recall wanting the money as much as wanting the independence and the excuse to get out of the house. Perhaps only having 13 channels and no Internet contributed to a level of boredom at home that doesn’t exist today. As a parent, I didn’t want my children to work during high school or college for that matter. Parents in my generation tend to want our children to “focus on their studies”. We also encourage them to have so many extracurricular activities that they really don’t have time to work. Are we in some way missing the boat as parents? Perhaps working, even at a young age, encourages the need to be more structured about getting your homework done? If nothing else, there is something incredibly valuable about working a minimum wage job and finding out that you have to work two weeks full time or over a month part time to buy an iPhone or an iPod touch. Today’s kids only see their parents swipe the magic plastic card and suddenly they have exactly what they want. Making the connection between working and spending is a valuable lesson that I fear is lost on today’s children. Another thing I’ve noticed about my children and their friends is that they aren’t lining up at the DMV to get their driver’s license on their 16th birthday. They seem to not be in much of a rush. Is this because there are more stringent rules on a 16-year-old driver than when I was growing up? Or is it just that they don’t crave the independence like we did? Are our homes a more friendly and fun place to hang out than our parents homes were, and again, is that a good or a bad thing? As for our education system, I think we’d all agree that something needs to change. Ben Stein actually quoted Adam Smith who said, “Between your ears and in your heart is where prosperity comes”. Ben was referring to intellectual capital, which he believes is disappearing. We need to get our youth excited about learning. We need to provide the opportunity within our schools where children believe that learning is fun and knowledge is priceless. Learning through reading is one of the greatest escapes from boredom that I know. So, is the younger generation simply entitled? Are students today just lazy? Is this a result of being born into one of the most prosperous times in our history? Or living in an age of technology where everything comes so easily and with the simple stroke of a keypad? How do we bring the principles of discipline, hard work and dedication back to our children? And how as small business owners do we hire this generation knowing that they lack the work ethic that prior generations had? I wish I knew the answers to these many important questions, but at least Ben got me thinking! 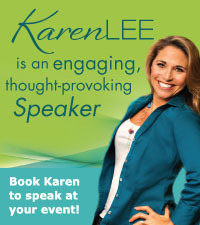 I’d love to hear your thoughts on this subject, so feel free to comment back to me below or at facebook.com/karenleetalksmoney.